Welcome to another lesson from Fall Stitch School with The Floss Box. This week I'm going to look at seeding stitches. And I don't mean "seed stitches", well I do, but I mean more generally stitches that can be sprinkled about in a regular or irregular pattern in crewel embroidery. These are filling stitches that don't completely fill an area. These types of stitches add a lot of interested to your stitching without requiring as much time as covering the area completely with long and short stitches or satin stitching. Plus it is a nice variety with areas that let a bit of the background fabric show through. What types of stitches can be seeded then? Basically any stitch that can form discrete units. Detached chain or french knots are classic examples in crewel embroidery. Seed stitches are another. By definition these are small straight stitches sprinkled about randomly. But straight stitches can be placed in more regular patterns too. The photo shows various stitches that could be used in crewel embroidery. My Swedish reproduction wool embroidery project has examples of using scattered french knots - in this case they follow regular patterns. You can see they add quite a bit of interest even without shading in a hole area. Let your imagination guide you! 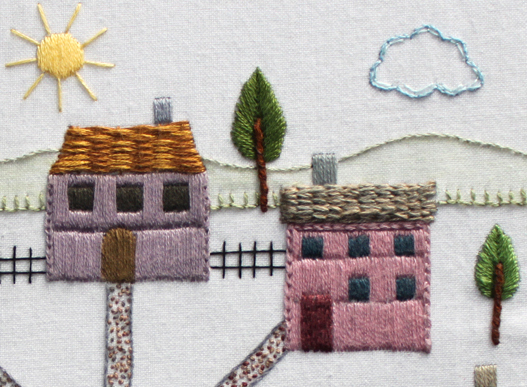 These sorts of stitches are not limited to just the crewel world!